So far we have discussed bulk handling solutions from CEVA Pallecon that are designed for the transportation of fresh food, and raw materials, liquids and work in progress. In the final part of this series, we will focus on the company's plastic folding bulk storage bins, which are available in configurations suitable for general products or food, as well as reusable bulk handling containers designed for the transportation of hazardous goods. CEVA Pallecon's CEVAbin is available in vented and non vented varieties to suit the product being transported or stored. The non vented CEVAbin container is designed for automotive and general products, and features easy to clean non-vented panels that are impervious to moisture. Durable and lightweight, these containers weigh only 47kg, and can be supplied with an optional lid where required. They are fully folding, allowing six folded containers to be stacked into one vehicle load space, which significantly reduces the space required for transportation of the empty containers. Further, they can be block stacked eight high when folded in a truck, further reducing space requirements. The vented CEVAbin container is ideal for the transportation and storage of food and general products, and is constructed from UV stabilised, 100% recyclable polypropylene material. Hygienic food grade quality, these containers also feature a 3:1 fold down ratio for transport once emptied, and are simple to clean, with vented side panels and base. anti-friction pads on base to minimise slippage. 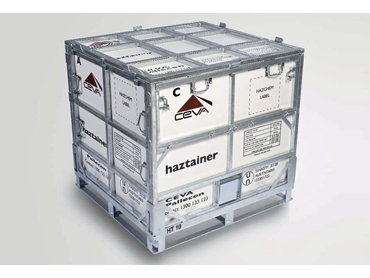 With the Haztainer, CEVA Pallecon states that it has virtually eliminated the difficulties in transporting dangerous goods. An effective alternative compared to single trip packaging, the Haztainer system is Australian tested and UN approved for the transportation of hazardous goods by road, rail and sea. They are ideal for dangerous goods in Packaging Groups II and III and Class 3 and specific Class 8 products including pharmaceutical and chemical. As with the CEVAbin, Haztainer units feature a 3:1 return ratio. Further, when compared to traditional 205 litre drums, these containers deliver a 25% saving in storage, transport and handling. They can be easily assembled, filled and disassembled by one person, and once empty, the returned container units are classified as suitable for general transport, allowing for significant transport cost savings. Available in 1,000 and 500 litre versions, they are made from recyclable HDPE panels with a galvanised steel base and frame. Lockable, tamper evident lids and panels provide added product security. a specialised disposable liner bag that negates the need for cleaning. The range of accessories available includes a wide variety of optional ancillary equipment developed and designed to efficiently fill and totally discharge all container contents.